Can a small ensemble perform a monumental work? Absolutely, as is demonstrated so impressively by Mozart’s Serenade for Winds in B flat major, K. 361. Just a handful of musicians – 13 in all – enchant us for well over 45 minutes with a superb and inimitable serenade of symphonic proportions. In this highly original composition one must constantly admire the thrilling presence of the players who perform brilliantly both as soloists and in pairs. Bowing to the traditions of the Viennese Divertimento, Mozart unfolds his artistic and entertaining ideas before his good-humoured audience, both those of then and of now. The small forms, such as the courtly Minuet and the cheerful Laendler, provide a marked contrast to the sanctified Adagio and the blithe Rondo-Finale in the manner of a drinking song. Every instrument was played by a maestro – oh what an effect – glorious and grandiose, inspired and sublime. I had an original 1963 London vinyl of this with the London Wind Soloists directed by Jack Brymer and thought, well, this multichannel Blu-ray is going to easily win out over the LP with its super hi-res sonics and the 13 players of the Stuttgart Winds spaced out in a circle around the listener, but it won’t equal the terrific performance the London musicians gave this important, lengthy (44 minutes) and often almost symphonic wind serenade. Well I was wrong, it also beats them in the performance area. Perhaps it’s also due to the absolutely perfect tonal characteristics of the digital Blu-ray compared to the small amount of flutter and wow existent in almost any turntable. Clarinets are especially known for sounding bad if the speed and pacing are not perfect. Mozart was an absolute master at achieving gorgeous tone color in his music, and this Serenade for 13 Winds is brilliantly colorful. Nikolaus Harnoncourt, viewed the work as really an opera for 13 instruments. Another conductor, Roger Norrington, worked with most of these performers in the SWR Radio Symphony Orchestra, where they are also members. They are all superb. The winds are mostly doubled, and the clarinets get to shine. They were fairly new to music and Mozart use of them captivated his listeners at the time. There are plenty of contrasts of large and full sounds with solo and more chamber-music sections, as well as contrasts in dynamics. There are also variations of the slow and the fast and sprightly, such as between the penultimate (and longest) of the seven movements: the Andante, and the closing cheerful Rondo. 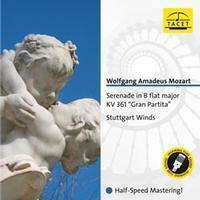 Serenade in B flat Major KV 361 "Gran Partita"
Tube Only” means: only tube microphones and amplifiers were used for the recording. For the LP, (except for rare exceptions, justified for musical reasons) the signal is even stored on a tube tape recorder and then mastered with valve equipment, so that one would be right in saying that for the entire production not a single transistor was used.